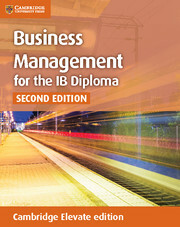 Designed for class use and independent study, Business Management for the IB Diploma (Second Edition) is tailored to the thematic requirements and assessment objectives of the IB syllabus.Business Management for the IB Diploma (Second Edition) includes learning objectives and summaries; integrated Theory of Knowledge material; text in clear sections, following the IB syllabus structure and content specifications; clear, accessible English for students whose first language is not English; exam-style practice questions; and chapter assessment and exam techniques sections too. 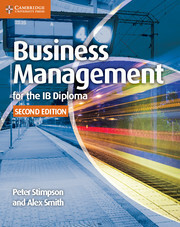 Written by two practicing Business Management teachers, Peter Stimpson and Alex Smith, it features the following topics: Business organisation and environment; Human resource management; Finance and accounts; Marketing; Operations management. Tailored to thematic requirements (NB) and assessment objectives of the International Baccalaureate Organisation’s syllabus. Key Theory of Knowledge exercises built into the methodology/text. Text divided into clear sections, following the IB syllabus structure and content specifications. Written in clear, accessible English (for students who are not mother-tongue speakers). Clear essay-writing and exam guidance. 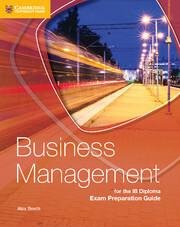 Co-written by practising IB Business and Management teachers and reviewed by academic experts in the field. Alex Smith teaches Economics and Business and Management at Sevenoaks School, one of the UK's leading IB schools. He has taught IB Business Management and Economics for over 20 years and is an experienced examiner.